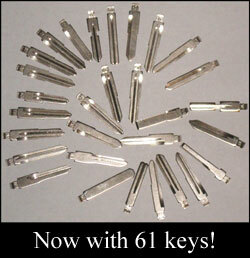 We now have 15 different styles of decoders, and 21 different high security auto picks from Lishi. We just gotten a huge shipment in on the Lishi picks, and they're at Rock Bottom price of only $46.95 each! We now have some videos of the high security picks and decoders online. They are in Chinese, but you can see the tool being used. As we update the page, we will add more, and hopefully have some ones in English too! The files can be a little large, but I have edited them down in size a bit. Most are 3-10 MB in size. Depending on your internet connection, they may take as little as 30 seconds to load, or much longer if you have a dial up connection. 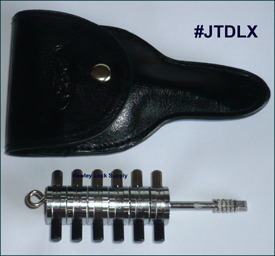 SALE - Jaguar/Tibbe 6 cut Deluxe Pick, with case and free lock! SALE - Ford Transit/Tibbe/Jaguar 6 cut deluxe pick set, with new lock. Volvo high security pick using HU56 key. Volvo high security pick using NE66 key. VW/Audi pick using HU66, older vehicles. VW/Audi pick using HU66, newer vehicles.